Join Us on Saturday, November 24th for Small Business Saturday! We started Vista Eye Care in July of 2010 as an independent optometry practice. We are not a franchise or chain, and we answer exclusively to our patients! Our owner-doctors live just down the street and are proud to call Thornton home. We are excited to celebrate Small Business Saturday on November 24th. 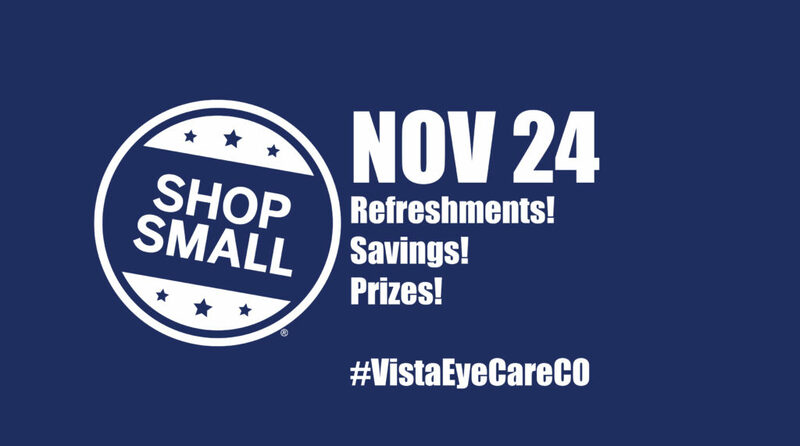 Come join us the Saturday after Thanksgiving for a day of prizes, refreshments, and great savings on glasses, sunglasses, and sportswear for adults and kids alike! Every purchase receives a gift! Due to overwhelming demand, we now offer gift certificates! Enter the drawing to win prizes which even include an awesome pair of Maui Jim’s!